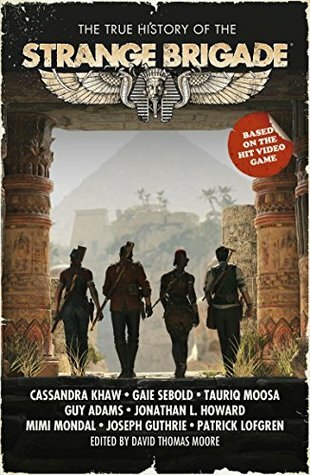 I'm not much of a gamer, so I don't know the first thing about Strange Brigade, which makes me an odd choice to read a tie-in book . . . but I couldn't resist the concept of a Department of Antiquities that is tasked with confronting ancient and terrible evils. Fortunately, The True History of the Strange Brigade is more an origin story than a tie-in, so no prior knowledge of the franchise is required to enjoy it. David Thomas Moore has gathered an impressive array of authors, who have contributed an eclectic range of genres. "And Was Jerusalem Builded Here?" by Cassandra Khaw serves as an absolutely killer opening to the collection, a creepy tale of Victorian horror with the darkest of morbid imagery - eyes the color of linen and soot, hair the hue of menstrual tissue, and more. A stunning read. "Ripples In A Polluted Pool" by Jonathan L. Howard merges pulp adventure and sci-fi horror, with a unique take on symbiotic parasites and hive mentality, with a truly chilling question of fate left open at the end. "The Professor's Dilemma" by Tauriq Moosa returns to the Victorian horror theme, layering in some archaeological adventure, with a story that offers some dark, intriguing insights into the members of the Strange Brigade. "Nalangu's Trials" by Gaie Sebold and "Where You Bury Things" by Guy Adams were two stories that didn't really work for me, distractions that caused me to put the book down for an extended period of time before coming back to it. "Peccavi, Or If Thy Father" by Mimi Mondal got things back on track with the story of a family curse, of a young woman struggling against death, in a well-written story that surprised me with the way it developed. "The Island of Nightmares" by Patrick Lofgren was a very cool story about a mysterious island, cannibals, monsters, and a mad villain. A truly heroic adventure. "Tessie's Song" by Joseph Guthrie was the pulpiest adventure of them all, and yet one of my favorites, a perfect way to end the collection on a high note. What begins with the undead in bar ends with a pterodactyl attack and a rescue from an island of dinosaurs. 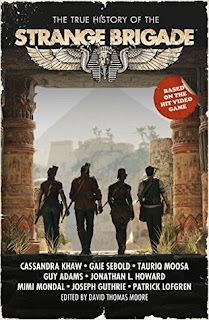 Aside from the soft spot in the middle, The True History of the Strange Brigade was a fantastic collection that delivered exactly what I was looking for. Some great characters, fun monsters, over-the-top adventure, and solid writing.